In his quest to writing a book about an evil house, a young writer will help the town inhabitant to get rid of the ancient vampire who inhabits it. 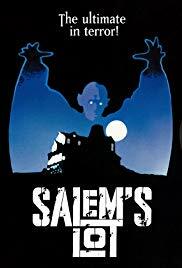 Salem’s Lot, by master of horror Tobe Hooper (Texas Chainsaw Massacre, Poltergeist, and many more…), is one of the greatest classics of the vampire genre. The movie, which came out as a TV-movie at first, is an adaptation of Stephen’s King novel of the same name, and also one of the first adaptation of a Stephen’s novel ever made (right after Carrie, 1976). The story is a rather classic one for those familiar with vampire genre (Fright Night, Dracula), with a master vampire coming into a town and slowly turning the inhabitants into bloodthirsty beats. Yet it has this familiar Stephen King’s touch, hard to describe but it has to do with the fact that the story happens in a small American town, with the characters that goes with it, etc. The story is really rich with plenty of endearing characters and interesting side stories. As for the atmosphere, which is one of the strong point of this movie, it has its good and bad sides. The few horror scenes are truly great, but they do feel too scarce in such a long movie. The few times you get to see the master vampire are all terrifying however. With its long teeth and yellow eyes, his face is unforgettable. Unfortunately, the rest of the vampires may appear a bit laughable to modern viewer (especially the bitting scenes…). Watching the uncut version 182min remains a challenge, for it slows down the film by a great lot, but it adds a lot to the story and the overall atmosphere so I only truly recommend it to the patient ones. Overall, Salem’s Lotremains a classic with a really creepy atmosphere, but one that doesn’t age very well, and may disappoint the youngest viewers.